I just came back from a birding trip to Southeastern Costa Rica that gave me chance to evaluate the Micro Four Thirds lens Panasonic Leica 100-400 mm under field conditions. Here are my thoughts! The Micro Four Thirds system is very convenient because of its excellent portability and image stabilization. The 2X crop factor means the compact Panasonic Leica 100-400 mm f/4-6.3 has the same reach of an 800 mm lens in full frame format… but I can handhold the MFT lens at a very slow shutter speed of about 1/30-1/60 of a second! The first uncommon bird we found was the 9 inches in length Pearl Kite (It is a recently arrived species to Costa Rica). 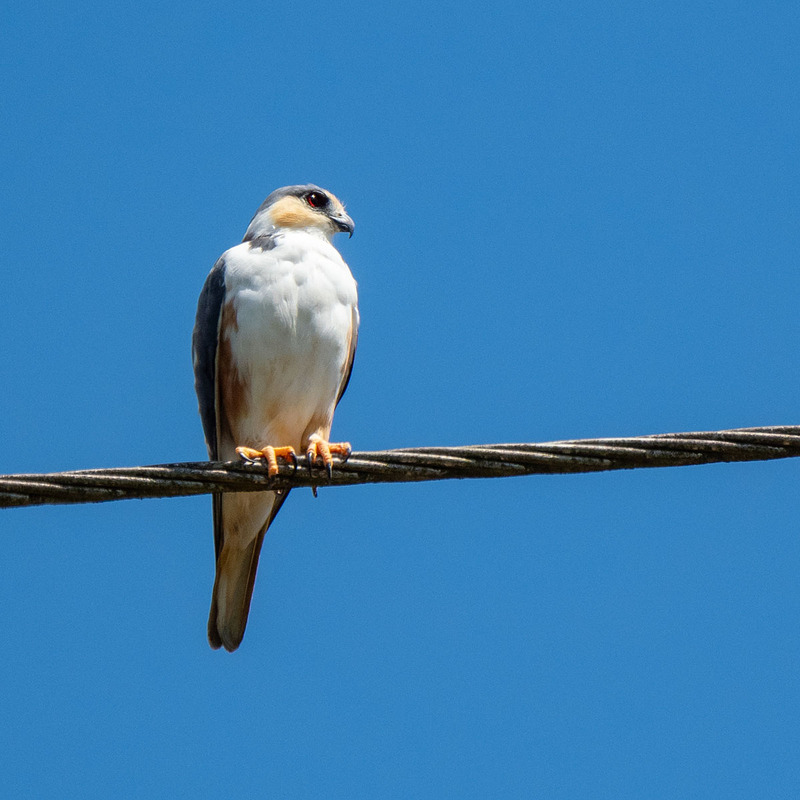 We photographed it resting on a power line… after a screeching birder’s bus halt. The trip was organized by the Costa Rican Birding Society (AOCR or Associación Ornitológica de Costa Rica). We traveled close to the Panamanian Border to look for birds that are endemic or newly arrived to the region and thus “rare” for us, Costa-Ricans. Some inhabit open areas, but others are found exclusively inside the Rain Forest. 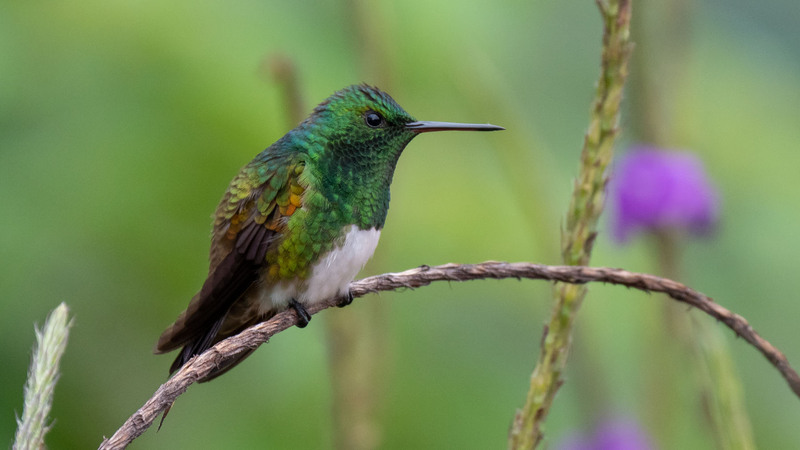 A Snowy-bellied Hummingbird, only found in the mountains of SE Costa Rica. 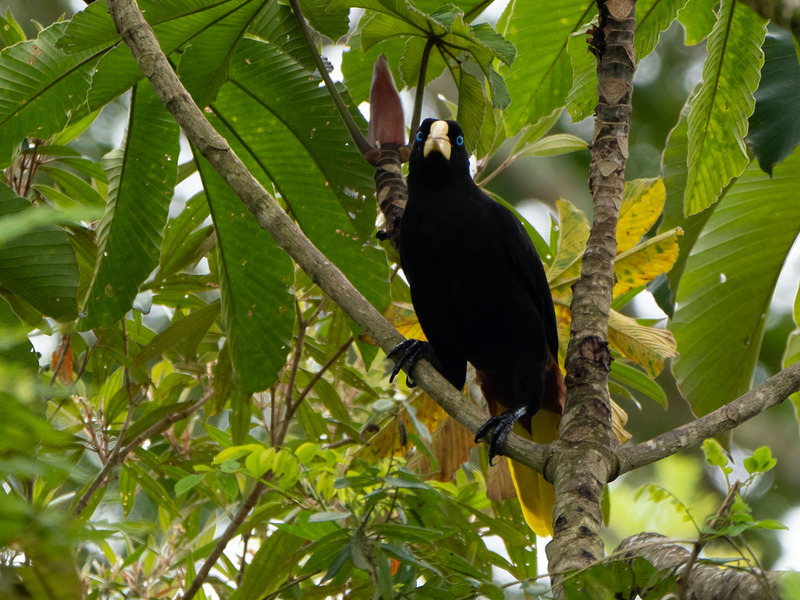 A Crested Oropendola looking at the camera with its distinctive blue-eyes near the town of San Vito de Coto Brus, our destination for the trip. If you have ever photographed inside a rain forest then you know that light levels are very, very low. Looking back at the EXIF data, I see I made my photos at a very demanding 1/60 s, f/6.3 and ISO 1600 with the lens at 400mm (800 mm full format equivalent). Sometimes I gained a full stop of light if the birds perched closer to a clearing… As you can imagine, I missed a lot of my shots due to poor focusing (little black bird under thick vegetation, mostly in silhouette), subject movement and, well, excitment-induced shaking and mistakes on my part! 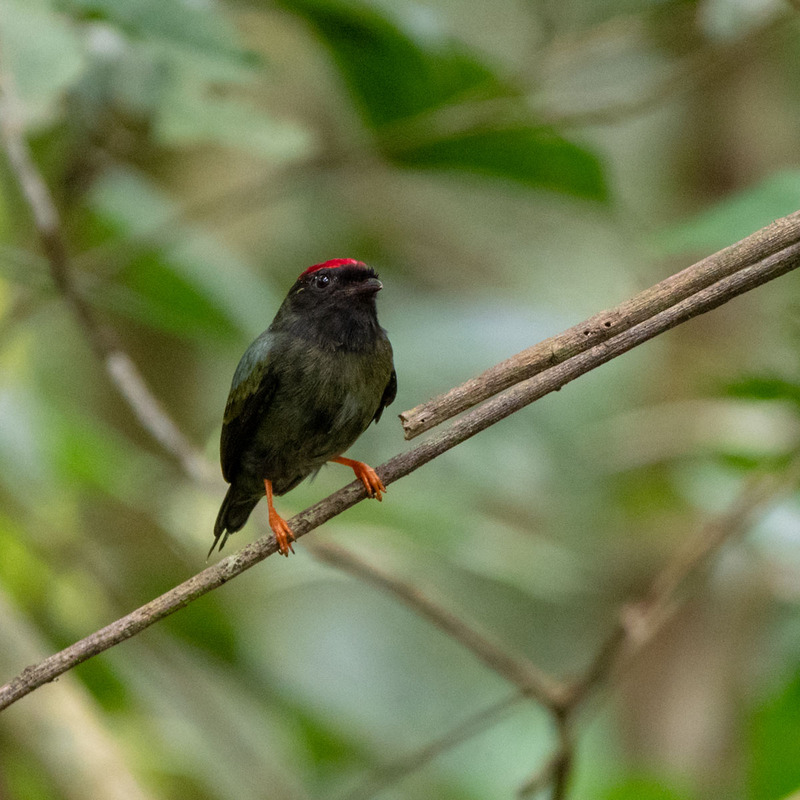 The Holy-Grail of our trip: Lance-tailed Manakin, 6” long. Its natural distribution barely gets it into Costa Rican territory along the border with Panama. Why not use a tripod and flash? Well, maneuvering a tripod among the thick branches, shrubs and the legs of the dozen other birders trying to get the shot is the main reason I was evaluating the lens for handheld shooting. Fill-flash is something I like to employ but… if the bird happens to be skittish and flies away… then I get too many birders yelling at me! So, what is my verdict? If you want to get mostly keepers, then you need fast lenses inside the rainforest. I am talking back- and wallet-breaking 400mm f/2.8 lenses used wide open on a full size tripod and gimbal head (be ready for heavy image cropping afterwards though). The f/4 lenses are at the limit of their possibilities. If you are OK taking chances, then the slower lenses are more or less usable, especially if you don’t mind going to high ISO values of 1600 or more. Why didn’t I go to 3200 of 6400? Because in most cases I am shooting tiny birds 20 or 30 ft away and I like to see at least some feather detail after cropping to about half the MFT image area. 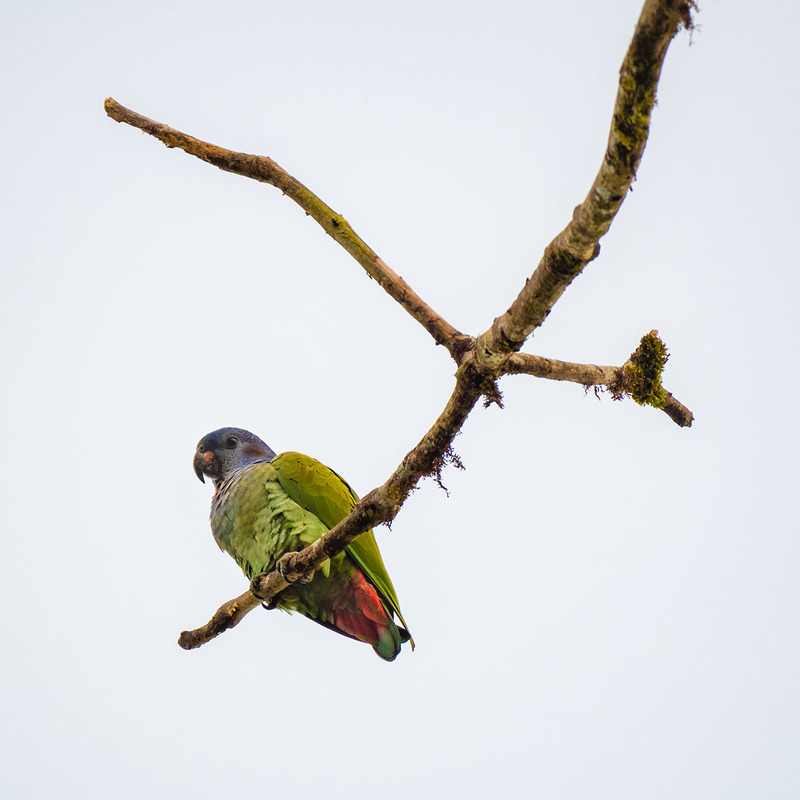 Just as the sun was fading we spotted (in dismal light) a Blue-headed Parrot. One for the checklist. At least the perch allowed for a nice composition. In good light the Panasonic-Leica shines: it is a versatile zoom lens that produces beautiful images in a very portable package. I love it. How is it like photographing in your local forests? Have you tried this lens or the other MFT telephoto lenses? These are splendid, indeed. As a bird person myself I can sense the passion yoo have for these profound creatures. Nice work. Thanks Stephen! Going out with good birders is a great learning experience too!